This section contains mostly photographs of the main historical figures of the Civil War. There are also photographs of artifacts, engravings, and paintings. The Civil War took place about 30 years before the invention of devices to record sound. Nevertheless, it continued to impact America's popular culture well into the 20th Century, as reflected here. 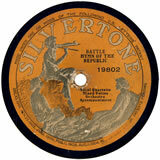 This section contains selections of Civil War music recorded in the early 1900s (many of which were intended to instill patriotism on the eve of America's entrance into World War I in 1917), several recordings made by Civil War veterans and eyewitnesses at the 50th (1913) and 75th (1938) anniversaries of the Battle of Gettysburg, and several examples of the Civil War in Old-Time Radio shows from the 1940s. This set of 88 collectible cards was first released in 1962 to coincide with the Centennial of the war. All 88 cards are presented.